Kaitlyn Riorden: Laura, Jesse Gervais: Ty, Louise Lambert: Carmell, Sheldon Elter: Barry. Photo by Dahlia Katz. 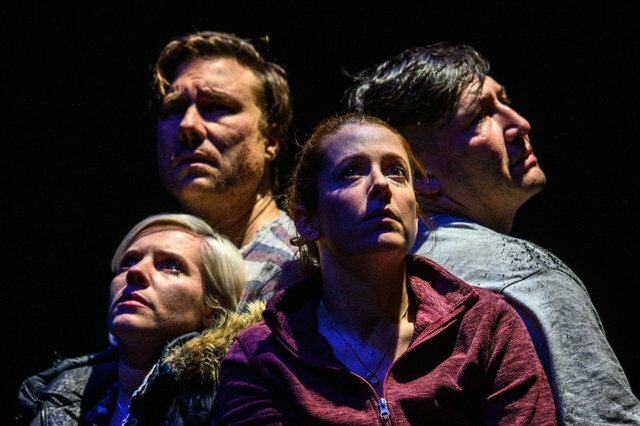 Award winning Albertan playwright Matthew MacKenzie enjoys a recent successful run of his production of Bears, a foray into the politics of oil pipelines in our country. With After the Fire, MacKenzie examines an equally large topic with the Fort MacMurray fires of 2015 and their devastating costs, both human and environmental. The fires were the costliest disaster in terms of resources that Canada has seen. Political and societal implications were vast – from South African “volunteers” on strike to a prime minister bent on pride. Mr. MacKenzie has chosen a very wide issue that fragments into many sub-strata. While industrial and environmental issues echo through the play, the human toll is the focus. Again, though, this is a wide examination of a host of human frailty and complex emotional relationships – a very weighty topic that was perhaps an overreach. The set is well-crafted by Alison Yanota with a theatre in the round experience (perhaps an ironic campfire setting.) The central focus is a large pile of rotting mulch which becomes both a stage and a challenge for each character. Above is a canopy of lifeless, oily branches that certify the theme in the title. Ms. Yanota compels us to understand that we are dealing with the “After.” Equally effective was a soundscape by Dean Musani which began with the conflagration but moved into subtler details of singular sounds from the forest or the hockey arena that haunts or startles the characters. The narrative surrounds the lives of two families linked by sisters, who have encountered different, but equally devastating results from the tragedy. Thousands were evacuated and many permanently lost their homes – billions of dollars were lost. The story of the two families focuses on the human toll, belying the cold overwhelming statistics. The Canadiana of Timbits and coffee cups was cleverly introduced in the middle of the mulch pile. The families cheering for their daughters in a typical hockey town and a typical hockey arena is a cover for the more searing elements of the story. For the two couples, crushing themes of separation, drug dependency, debt and guilt slowly wash up throughout the narrative. Again, these were broad topics that were not given the depth that was needed. The two men took on the physical challenge of digging in the pile throughout the play. As they toiled, the harsh realities of their lives become evident. Why they are digging is unclear, but the choreography from lazy to frenetic work mirrored their dialogue. A strong performance from Sheldon Elter began as the silent digger, Barry, who is the sounding board for Ty played by Jesse Gervais. Eventually Barry becomes more engaged and much of his dialogue is delivered in a forceful staccato voice. Ty’s character is looser and more unpredictable, careening into wild elements of despair. A highlight of their angst was a combative fight scene, directed by Richard Lee, realistic and natural which sent them into the muddy, earthy elements of their world. The wives, played by Kaitlyn Riordan and Louise Lambert, were mostly a separate narrative from the men. They would insert themselves, sometimes on the periphery and sometimes into the middle of the pile, mirroring or supplementing comments from the men. Some of their dialogue was less effective with rash movement and highpitched voices. Some movement, though, was striking as they dangled along walls or fought with the mulch pile that signified an adversary. The four characters had what we might call their “meerkat” moments as they each made it to the top of the pile to deliver personal reflection – clever blocking from director Brendan McMurtry-Howlett. Dark symbolism throughout the play began with some startling and creative images – a two headed chickadee with all the associations of endless sight or Barry’s obsession with tragic creatures. As the energy builds to a bizarre final scene, some of the symbolism becomes overly heavy, detracting from the themes that could use a subtler approach. Mr. MacKenzie and Mr. McMurtry-Howlett have produced an entertaining and thoughtful study into the ironies of both depending on and destroying the land. Issues of responsibility towards both family and environment are well-highlighted. The jarring of cultures, from indigenous backgrounds to Boston Pizza “fishbowl” night, initiate important conversations. “The fires to come” is a memorable line opening audience awareness about the need for future conversations. Runs at: The Theatre Centre,1115 Queen St. W. Toronto. January 10 – 19, 2019. Tickets can be booked at 416-583-0988.